In many WebSphere® Application Server environments, support personnel often get more questions on application performance and tuning than WebSphere Application Server tuning. While there is much documentation and guidance for installing, monitoring, and tuning the performance and scalability aspects of WebSphere Application Server, not a lot of guidance and recommendations for performance and scalability considerations are given when designing and coding applications that execute in the WebSphere Application Server environment. 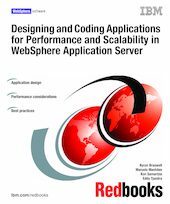 This IBM® Redbooks® publication provides performance and scalability considerations to keep in mind when developing and coding WebSphere Application Server applications. In this book, we take a layered approach to application development covering performance and coding considerations for each layer in a separate chapter. In addition, various application development tools and strategies are compared within each layer along with best practices to keep in mind when designing and developing applications. The target audience for this book includes the application development team, especially architects and developers. It also includes developers with experience using various application development techniques and tools for the different layers in the application architecture.